New Year’s tours depart from Marrakech or Fes and take you across the panoramic High Atlas mountains. Follow the ancient Salt Road to Ait Benhaddou Kasbah, a World Heritage site, and explore the majestic Dades and Todra gorges. Stroll through local village markets and take a 4x4 excursion to an enchanted desert oasis before arriving in the heart of the Sahara. Here your camel awaits to take you on a trek to the breathtaking Erg Chebbi dunes, in a quiet region far from crowds and busy roads. New Year’s Eve unfolds under a galaxy of stars, where you experience a fantastic celebration of singing, dancing and rhythmic African drums. 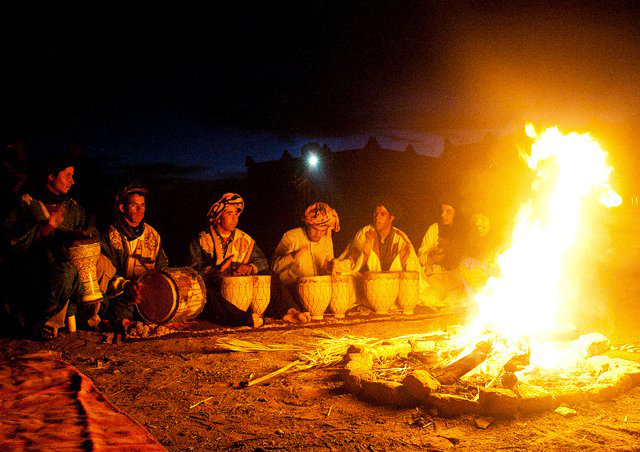 Ring in 2013 around a large camp fire, amongst the rhythms and spirit of the Berber nomad people of the great African Sahara. Note: Desert tours are 3 to 5 days (flexible) with overnight camel treks. After meeting you at your hotel in Marrakech after breakfast we will go towards the High Atlas through the Tizi-n-Tichka pass, along a road that climbs from the plains up to 2260 m above sea level passing through small villages, small waterfalls, through the continuously changing landscape and colors of these beautiful mountains. We can to make a stop on the pass for a cup of refreshing mint tea and admire the scenery before taking the road to the Ait Benhaddou Kasbah, where we will arrive in time for lunch. Here we can visit the famous Kasbah, declared UNESCO World Heritage and which was the scene of films like The Gladiator, Babel, Lawrence of Arabia, The Legionary, The Sheltering Sky, and many others. will visit the town of Ouarzazate, the Kasbah of Taourirt and the Atlas Studios movie studios, the largest and most famous of all Africa.Then we will go through Ouarzazate, the famous Valley of Roses and the Dades valley, reaching the Dades Gorge in time for sunset where we will stop in a very traditional and romantic hotel for dinner and overnight. In the morning, after breakfast, you may take a walk through the Dades Gorges, and then take the car to drive the road of the 1000 Kasbas, go through Tineghier village , and the Jewish Kasbah, arriving to the Todra Gorges in time for lunch, take a walk in the Gorges before taking the road to the Merzouga desert by way of Erfoud and Rissani arriving before sunset. Diner and overnight with Saharan drums in a nice traditional Kasbah in the foot of the erg-chebbi dunes . Shower and relax before we take the 4*4 for a tour of approximately 3 hours and 1/2 in the desert to see the different faces of desert dunes with its black volcanic rocks, passing through small villages, where we will stop to lunch with a Berber family in their tent, along the road used by the Paris Dakar rallye We will reach a cave where you can discover how the local people extract the fossils from the heart of the earth,after lunch in the afternoon we will start off by Camel into the Erg Chebbi Dunes for an incredible and unforgettable night in a Berber tent where we will have dinner accompanied by the rhythm of drums and songs of Berbers, Touaregs and of the populations of southern Morocco under millions of stars and if we are lucky you can also see the Milky Way. Diner and over night in a berber tent. Upon arrival at Merzouga we will explore its territory better and subsequently go to the Khemlia village where local people come from black Africa, we will appreciate their traditional music and where every year in August there is a famous festival. He will then visit the Dnit Srji Lake, famous for bird watching and its pink flamingos. We will then visit Rissani, former economic capital of Morocco from where the caravans leave and where a market takes place, known for the barter of donkeys and Berber medicines; if you have not seen enough Kasbahs yet, here you can see a lot more. Lunch will be with a family that will make you taste the Touareg Berber pizza with its 44 spices. We will return to Ouarzazate by a different road that passes through the Nakob village and the Draa valley. We will then stop for tea and a visit to Agdz and after this we will start off again for Ouarzazate where we spend the night in a romantic and beautiful riad with a pool to cool off after a long day. Dinner will be served on the terrace. After breakfast we will visit the town of Ouarzazate, the Kasbah of Taourirt and the Atlas Studios movie studios, the largest and most famous of all Africa. From here we head to the Fint Oasis, near Ouarzazate.we will have a lunch in the historical Kasbah ait ben haddou, We then take the Tizi-n-Tichka road passing through small villages. We will then reach Marrakech in the late afternoon for the end of the tour.